Encouraged – As a motivational speaker, Chet’s desire is to encourage his listeners to keep on living despite the challenges they have been given. Chet knows how easily people can get bogged down in day-to-day living, and his bright, happy spirit enourages all who listen. Challenged – Chet believes that while he does not have all the answers, he can challenge others to live their lives with a positive attitude. 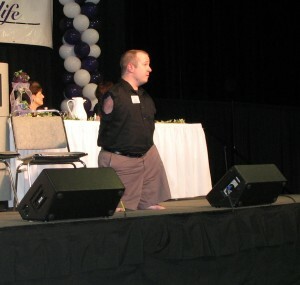 He says that if he can live a happy life with no arms, then you can, too! The video below is a promo of Chet speaking. Part of this promo is from his “All He Needs” presentation. I hope all my friends will take a moment to watch this video. This is a remarkable man and I for one feel very humble and contrite when I realize just how much more I could, and should, be doing for the kingdom. great inspirational life…Chet McDoniel from Taxes.. I went to school with you in bossier at apollo through the fifth grade until I moved to Oklahoma. I actually think about you from time to time. Just looked you up. I literally googled “chet no arms” and before i typed in “arms” google had already put “chet no arms” as my second choice, haha. Im encouraged to see what you are up to these days. I work with a lot of pro-life ministry here in Mississippi where I reside now. Would love to have you come out and speak sometime. Hope you remember me, we were in AIM together also. Email me when you get a chance.